The Vito & Vito Show Blog: No More Horse and Carriage? No More Horse and Carriage? Horse and carriage rides through Central Park are beautiful, romantic, and a staple of New York City culture. Well, it may all be gone soon. 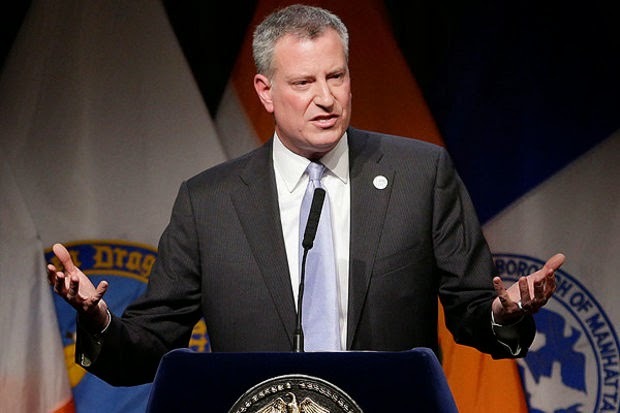 Mayor de Blasio says a new bill will be delivered soon to fulfill his campaign promise. What? You didn't know he wanted to do that? Why would any New Yorker vote for someone when they didn't know their agenda? Welcome to the "People's Republic of New York". Mayor de Blasio avoided questions concerning a possible compromise allowing horses to stay in certain stables inside Central Park. "It is a very complicated issue.” Mayor de Blasio stated. The City Council may not pass the bill once it's proposed. Hopefully they do not. As a Councilman, de Blasio doubted a horse-carriage ban, but once campaign donations started, Mayor de Blasio quickly switched positions. We've seen this when he cut charter school funding because of the great relationship he has with the UFT, the largest teachers union. Now, NYCLASS and others have donated handsomely to de Blasio and the money has changed his views. Some even gave too much money and de Blasio had to give some back to avoid legal problems. Some ask why de Blasio, why? Because horses do not belong in a fast paced, urban setting. But they are well protected and an esteemed part of New York City culture for years. For goodness sakes, they were a means of transportation only until the twentieth century. It's all the money that unions and organizations throw at him so he can change legislation that only a small percentage of people really want. A Quinnipiac poll shows over 64% of New Yorkers surveyed want horse-carriages to remain! The New York Daily News has even started to fight back! You can sign their petition and join the fight to help save New York's horse-carriages. In July they hand delivered over 40,000 signatures to City Hall and protested. That is not how you run a government! Mayor de Blasio wants to add antique cars instead of the horses to Central Park. That would make New York City's tourist attraction a laughing-stock. 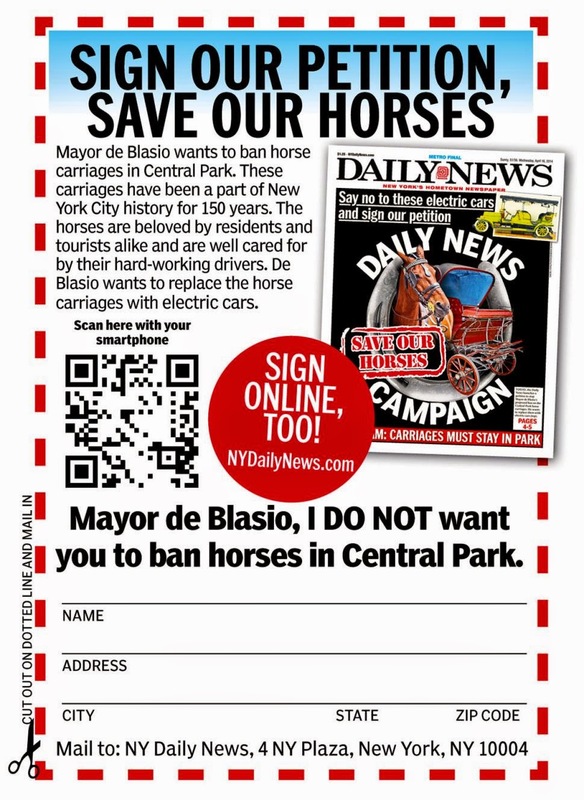 There's a list of problems that stem from allowing cars in Central Park instead of horses. Also, it's a business! Why ban the business? Animal cruelty and animals rights activists are fighting to ban the carriages. Nonsense! The animals are treated just right, and if they aren't, then pass laws that force them to be and fine or jail the people who treat the horses terribly. But they should not be banned because a few groups threw money at de Blasio's campaign! This is the liberal agenda I was talking about! Nobody else saw this coming? Only me? People need to wake up and fight back against these greedy, dishonest, liberals! They are asking for #WAAR! You can check out this article and more by me on Newsninja2012.com!